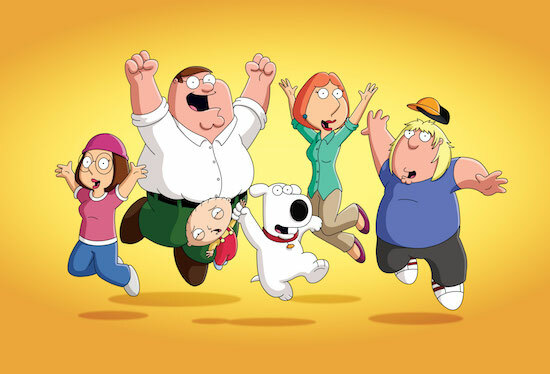 TBS is celebrating FAMILY GUY’s 20th anniversary—belatedly; the series bowed on Fox on January 31, 1999, though episode 2 aired April 11—with a marathon of episodes selected by series creator/star Seth MacFarlane. During their second honeymoon, Peter and Lois stumble upon a horror too great to bear: Mel Gibson’s Passion of the Christ 2. After winning at Trivial Pursuit, Peter claims to be a genius, so Brian asks him to take an IQ test to prove it. Peter broadcasts a television station out of the Griffin home. A near-death experience lands Brian in the hospital but infuses him with a new passion for life. At his high school reunion, Peter pretends to be a millionaire, but the truth comes out when he meets Tom Brady and loses all self-control. The Griffins get robbed; Peter narrates a chain of events in world history that explains the Griffin name. Brian accidentally sells Stewie’s beloved teddy bear, Rupert; Meg must drive Peter around after he loses his license. With the Griffins stuck at home during a blackout, Peter begins to tell a story, which leads to a Star Wars flashback. Acting out scenes from Star Wars Episode IV: A New Hope, Peter plays Han Solo, Lois is Princess Leia, Stewie becomes Darth Vader, Brian plays Chewbacca, and Chris is Luke Skywalker. Cleveland and Quagmire will play the parts of R2-D2 and C-3PO, while Herbert is the wise Obi-Wan Kenobi. Peter rediscovers his love for the painfully annoying song, “Surfin’ Bird” which drives people around him crazy; and when Peter finds Jesus in a record store, he’s determined to be his new best friend. Mort Goldman accidentally steps into a time machine and winds up in 1939 Poland in the middle of the Nazi invasion. Brian and Stewie follow him to Nazi Germany in an attempt to save him and bring him back to the present safely. Stewie and Brian visit alternate universes and become stuck in one ruled by dogs. Peter believes he possesses psychic powers; Chris falls for a classmate with Down Syndrome. Brian’s television pilot script gets picked up by a network, but he’s horrified when changes are made to his concept; Chris and Meg accidentally knock Stewie unconscious. Brian and Stewie are locked up inside a bank vault for an entire episode. People throughout Quahog are summoned to a mysterious mansion, where actor James Woods hosts a dinner party to atone for his misdeeds and guests begin dying, one by one. After more of James Woods’ dinner party guests meet grisly fates, the identity of the mysterious killer is revealed. Brian and Stewie take their adventures to the North Pole to seek out Santa Claus. Using the time machine, Stewie and Brian accidentally travel outside the space-time continuum, where Stewie causes an explosion that creates the universe; Bertram travels back in time to kill one of Stewie’s ancestors: Leonardo da Vinci. Brian and Stewie travel back in time to January 31, 1999, and witness the events that took place in the very first episode of Family Guy, “Death Has a Shadow”. Family Guy / American Dad! / Cleveland Show10:30 PM – “Hurricane”Stan attempts to save his family after a hurricane floods Lower Langley — despite Fran’s warnings that Stan is a bad decision-maker during a crisis.